Wine gift baskets are a great gift for a number of reasons. The gourmet food items, the decorative items in the basket, and just the overall appearance of a classy basket like this just to name a few. But when is it ok to give a basket like this? The answer, pretty much always! However, there are a few occasions in particular where a wine basket is especially appropriate. Birthdays – Who wouldn’t want a basket like this on their birthday? The items in these type of baskets encourage your recipient to take time for themselves, relax, and indulge. Or, if they’d rather share their goodies (and a bottle of wine!) they can. The items in these baskets are totally sharable. Housewarmings – Congratulate friends or welcome new neighbors with a wine basket. The cheese and snack mixes in this gift facilitate conversation and promote catching up or getting to know new friends. Be sure to bring a bottle of wine to pop open too! Anniversaries – Give your favorite couple the gift of a romantic night together over their favorite bottle. Some of these wine baskets have enough goodies in them for an entire meal! They’ll cherish the time together, all thanks to your thoughtful gift. 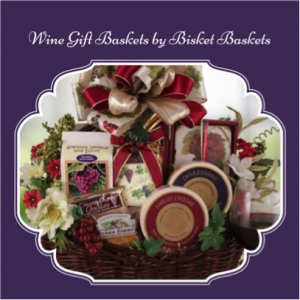 There are plenty of occasions to give one of Bisket Baskets’ wine gift baskets, these are just a couple! Browse our selection of baskets today to start gifting the best wine companions for your recipients today. They’ll love the gourmet treats and the thoughtfulness of your gift and you’ll love giving the perfect gift. Don’t Show Up Empty-Handed – Bring One of Our Wine and Cheese Gift Baskets! Check out our wine gift baskets! It’s always customary to bring a gift for the hostess/ host of a party to say thank you. However, choosing the right kind can be difficult because people have allergies or particular preferences. The perfect solution to this hard decision is easy: one of Bisket Baskets’ top quality wine and cheese gift baskets. Each one of these handcrafted wine and cheese gift baskets are filled with carefully chosen products so everyone is bound to find something they love! Worried that this isn’t suitable to bring to certain events? 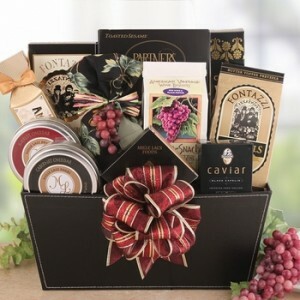 Our sumptuous wine and cheese gift baskets contain no alcohol products! We created the perfect accompaniment to wine because all of the products inside are wine-themed. Pair the delicious Merlot cheddar with your favorite red or white! Or mix the award winning Wine Glace drink in a glass of wine to make a flavorful Wine-a-rita! Not a fan of cheese? Not to worry! There are also yummy cookies, pastries, and wine biscuits to sample. Both kids and adults will keep visiting the appetizer table to have more of this delicious gift basket. Be the person everyone always wants to invite because they’ll know you’ll bring the best treats! 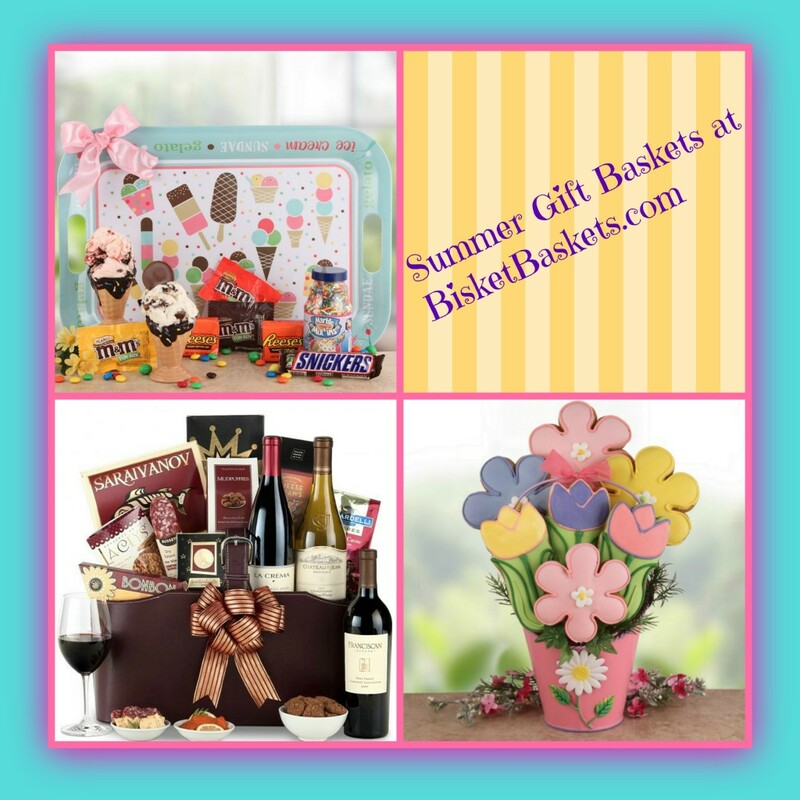 Inside all of Bisket Baskets’ superior gift baskets, there is always something for everyone. For more help on choosing one of our fine wine and cheese gift baskets, chat live with our professional staff at BisketBaskets.com! It sure can be hard to find gifts that will delight just about everybody. However, wine gift baskets almost always do the trick. A person can enjoy this item no matter his or her age, background, or interests. Even people who rarely entertain can use these baskets as they can offer the vino to guests when they host a dinner party! When you give wine gift baskets to your parents, siblings, relatives, in-laws, friends, colleagues, acquaintances, neighbors, and/or others, you’re doing something to boost their well-being. Yes, scientific studies have indicated that the moderate consumption of wine can improve people’s cardiovascular fitness, reduce their stroke risks, and lower their stress levels, among a variety of other medical benefits. At last, health studies are telling us something that we actually want to hear. Wine gift baskets represent uncommon, thoughtful presents. As such, you’ll really stand out in people’s minds when you give them these baskets. Indeed, when those individuals finally get to sit back, relax, and sip some of that delicious wine, they’ll think of you. Plus, they’ll come to associate you with happy times. What better way is there to impress someone you care about? What better way is there to spread joy and peace during the holidays or at any other time of the year? 4th Of July Summer Gift Baskets – Be the Life of the Party! If you’re one of many observers of Independence Day, the 4th of July, then there’s a great chance you’ll be attending an annual barbecue. Whether attending an outdoor bash at a friend’s home or an annual family festivity, there’s no better way to say ‘thanks for being a great host’ than with summer gift baskets from BisketBaskets.com! Bringing a gift to an invited party is a unique, gracious and respectful gesture for the party’s host as well as the other guests. Ice Cream Fun Basket: Nothing says ‘summer barbecue’ like a delicious, cold and creamy dish of ice cream. This basket includes all the fixings for the ultimate Independence Day sundae, including sprinkles, candy toppings and a melamine tray. Ice Cream is not included! 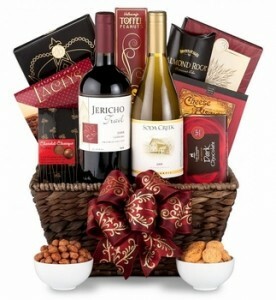 California’s Finest Wine Basket: Enjoy a glass of fine wine and the delectable flavor of rich Ghirardelli chocolate with this fine wine basket. This is a basket to enjoy after the little ones have gone to bed! This amazing gift basket includes your choice of wine trio, Ghirardelli dark chocolate squares and sun dried tomato cheese straws! Bouquet of Flowers Cookie Gift: Not quite a basket, but the perfect gift to really add a splash of color to any 4th of July party. What’s more enjoyable than a bouquet of colorful flowers? How about flowers made of delicious cookies! Putting the ‘Fun’ in Fundraising with Gorgeous Gift Baskets! While there are certainly plenty of fundraisers held during the fall and winter months, as spring brings more people out of their homes for countless events, fundraising types and opportunities open up! People often respond better to a donation request if they have the chance to win something in the process, and among the most popular options are attractive gift baskets. When choosing gift baskets for your fundraiser, consider the average age of those who will attend, and what their interests might be. While many of our gift baskets have a universal appeal, something more tailored to your attendees might draw even more interest! Silent Auctions – A Little Work Brings a Big Reward! While the best part of silent auctions is the generally large donations they bring in, they are also quite fun for the attendees. To set up your silent auction at your fundraising event, you’ll need just a few supplies, most if not all of which will already be at the location. Be sure to have enough tables to display the gift baskets attractively, a tablecloth to add to the polished appearance, a sheet of paper to place in front of each gift basket, and a few pens. After you have set your tables up, display your gift baskets with enough space between them that 2 people can stand side-by-side when bidding on adjacent baskets. When someone finds a basket that interests them, they will add their name and the amount they are willing to bid to the paper in front of that basket. If someone has already placed a bid, their bid will have to be higher, and the interested person after them will have to bid even more yet! 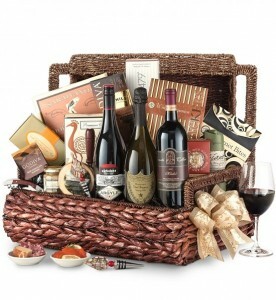 For baskets with wide appeal, such as coffee gift baskets and wine gift baskets, those bid amounts can climb quite high. It’s important to remember that people are primarily interested in making a donation to a cause they care about – having a chance at winning a great basket is just the icing on the cake. This means that they will typically bid much higher than the actual value of the basket. If you want to keep bids anonymous, you can simply assign a bidding number to all attendees. They can then write down their bidding number and bid amount instead of including their name. As the silent auction draws to a close, let the guests know to get their final bids in! As these auctions usually run the majority of the fundraising event, many will be sure to stop mingling for a moment to raise their bid if need be. If two friends or colleagues both want the same basket, their playful competition to take home the prize can result in a big win for your fundraiser! Ring in the New Year with our Holiday Vineyard Themed Gift Basket! Celebrating the past year’s accomplishments, little moments, and small victories is all a part of ringing in the New Year! 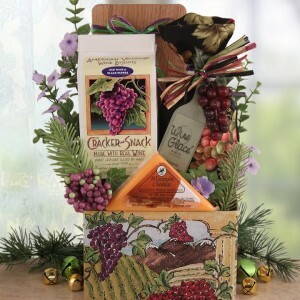 Why not do it with a Holiday Vineyard themed gift basket? At Bisket Baskets and more, we have everything you need to entertain your guests and bring in the next year the right way! 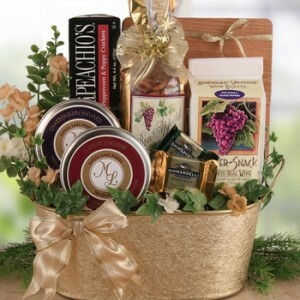 This gift basket has exactly what you need to wine and dine your guests. With an assortment of cheese and wine biscuits, you’ll have your guests enjoying the ball dropping at midnight, the rejoicing, and the food as well! Did we mention that this magnificent basket comes with our Wine Glacé? This powdered mix can be mixed with whatever wine you’re serving at your party (we suggest sweet wine) and turn it into a Wine-a-Rita of sorts! This fun concoction was voted Best New Drink winner at the National Gourmet Food show two years in a row! Talk about a fun way to celebrate! Want to shop our awesome gift basket selection or take a peep at our Holiday Vineyard Wine themed gift basket? Shop with us today at BisketBaskets.com! There are many times in our lives when keeping within a tight budget is important. It might be a weekly thing, such as keeping a close eye out for sales when making the grocery shopping list, or it can be most apparent when shopping for a big ticket item like a car or home. It can also be a daily thing, where we either consciously or unconsciously do a quick analysis of each purchase to determine whether it is worth the price, and/or how prepared we are to spend that much money. Budgeting is simply part of life; it’s not usually painful, but it’s also not exactly fun. Spending money, however? That can be very fun! And it’s usually more fun when you have more to work with. It’s also usually more fun when that ‘more to work with’ isn’t all coming from your bank account! Now, don’t get ahead of us. We aren’t suggesting you rob anyone! But we are suggesting that we have some of the most lovely, luxurious wine gift baskets available, perfect for giving as a group gift. Whether it’s a wedding gift for a close friend, or a present for your boss, pulling your money together with others lets you all give the great gift you want to give, but can’t budget for alone. Premiere Wine Gift Baskets: When only the best will do, our Unparalleled Luxury Wine Gift Basket is ready to leave them speechless. This handsome basket is packed with Dom Perignon, Argyle Nuthouse Pinot Noir and Leonetti Merlot. Rich Godiva delicacies snuggle up alongside smoked Gouda cheese, lovely lemon raspberry cookies, and so many more taste bud temptations. This gourmet gift basket is designed for the wine lover that deserves the finer things, so if you hope to receive one yourself, you better be nice! Wine & Gourmet Extravagance Wine Gift Basket: Love the Unparalleled Luxury Wine Gift Basket, but need something a bit smaller and more affordable? You can still show your appreciation and impress the recipient with a more petite price tag! Red wine and chocolates are the stars of this gorgeous gift, with cheese, crackers, almonds and cookies earning their fair of fans as well. Wonderful for a wedding or housewarming, brilliant for a birthday or your boss, this stylish basket is sure to cause a sensation and leave them thinking you spent much more!